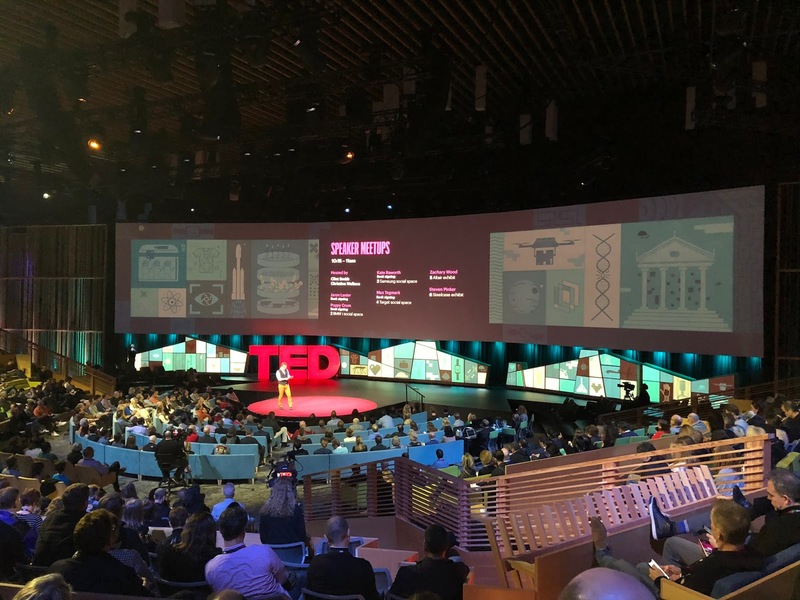 Day 2 of TED 2018 was one that began well and got stronger as the day went on. 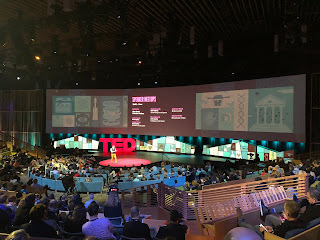 It was one of those days at TED where it will take me a long time to process some of what I heard. It was also a day where writing this blog entry will be very helpful in processing, as well as remembering, later what I heard as subsequent days will make me forget much of it. Unfortunately, it was a long day where I will not have time to write about much of what went on. The first session's title was After the end of history... The talks were generally good and covered ideas including Poppy Crum on the use of technologies that can infer our internal state (feelings and emotions) from external clues like our body temperature and the composition of the air we exhale, Cesar Hidalgo on the possibility of using AI bots rather than elected officials in a representative democracy, and Kate Raworth on the need to balance economic growth with our impact on the planet. The highlight of the session for me was Yuval Harari. He spoke via a hologram from Tel Aviv which worked and was minimally distracting. There were some audio glitches at the beginning, but once they went away, it really was as if he was on the stage. If you look closely at the picture, you may be able to see the transparent screen his image was projected onto. I enjoyed reading earlier this year his book, Sapiens: A Brief History of Humankind. The topic of his talk, however, was instead the difference between fascism and nationalism and what those might look like in the future. He sees nationalism as the love of country, and possibly seeing your country as better than all others. In contrast, fascism is the love of your country to the exclusion of all other countries and things. In fascism, not only is your country more important than other ones, but more important than art, family, faith, and friends. Anything that detracts from your country's goals is to be suppressed or eliminated. His caution is that we are wrong to think of fascism as an easily identifiable and ugly thing. He quipped that he never understands how Voldemort and Darth Vader have any followers--they are ugly and mean to everyone around them. Who would sign up for that? In contrast, fascism succeeds because, at least initially, it is attractive. It is about belonging to a beautiful nation. He further cautioned that in the future, control of data may lead to fascism and that corporations rather than the state may be the agents of such a future. His talk is definitely one I will have to re-watch when it is available. The second session, Nerdish delight, consisted of folks talking about cool technology they are involved in developing. Though a couple felt like blatant ads (the Light L16 camera and Token's identity/security ring), they were effective ones that made me plan to look into them further. The talks included Giada Gerboni telling about how soft robots can succeed where traditional rigid ones cannot, Dina Katabi told how weak wireless signals can be used to detect breathing and sleep patterns, Gwynne Shotwell of SpaceX talked about their future plans for larger rockets, going to Mars, and 30-minute flights across the earth, and Supasorn Suwajanakorn showed the technology that was able to produce videos of Obama and Bush speaking just using audio with the obvious implications and possible remedies. The best talk for me was Simone Giertz of Youtube and bad robots fame. It was not inspiring, new, or informational, but it was both fun and funny while still conveying a useful message of being willing to fail. She showed her famed toothbrush helmet as well as a large, circular collar for eating popcorn and drinking water while speaking. It work as well as you might expect one of her gadgets to work! She had a great quote on how she choose her current line of work, "The easiest way to be at the top of your field is to pick a very small field." It is hard to adequately describe her talk, but her abundant enthusiasm made it work. After lunch, Mark and I attended a workshop given by Roman Mars called So you think you can podcast? He conducted a short interview of graphic designer who had recently published a book on signs used in protest movements. It was about a 5-minute interview about the I AM A MAN posters used in Memphis during the civil rights movement. He then went through the steps he takes to turn that interview into a 2-minute segment such as he would use in his 99% Invisible podcast on design. 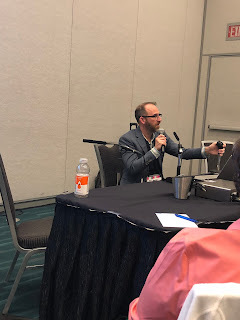 It was fascinating and made me very much want to try my hand at podcasting and also made me realize that to do it well would mean using an audio engineer as I can't see myself learning all that would be necessary. The final session was dedicated to TED's Audacious Project, the successor to the TED Prize. I had grown skeptical about the TED Prize over the years and was not sure what I felt about the new format. Now, my main concern is whether they will be able to replicate this in the future. There were five winners and each had already been pledged a significant amount of money. The goal is for each of them to use the resources of TED and the TED community to use that significant start to gain more moment and raise the full amount of money necessary for their audacious goals. 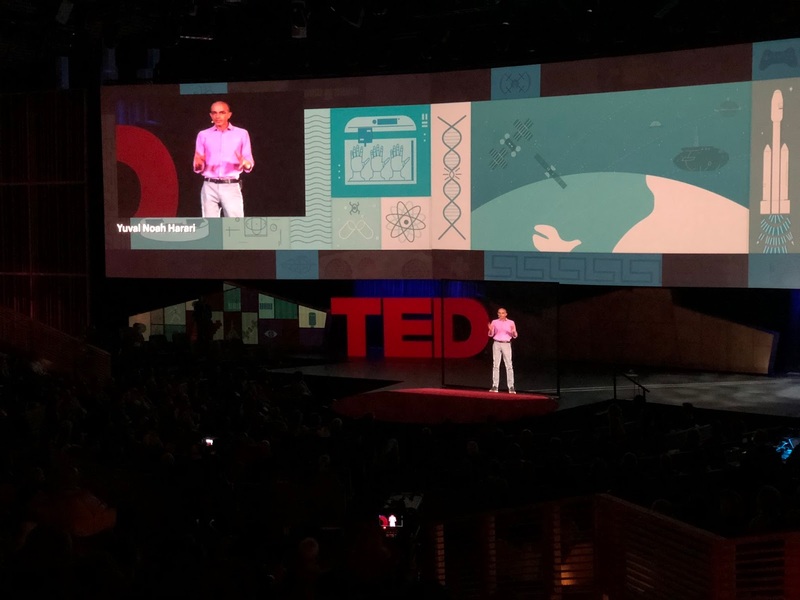 The winners included Fred Krupp of the Environmental Defense Fund whose goal is launch a satellite that will detect methane leaks in the hopes of significantly reducing methane emissions and having a measurable impact on growth in global warming by 2025. Caroline Harper, with Sightsavers, described her audacious goal of eliminating blindness caused by trachoma. Heidi Sosik's goal is to explore the deep ocean to better understand its inhabitants so that they can be appropriately protected before it is too late. Two of the winners stood out to me and are ones that I hope to find ways to support in the future. The first was Robin Steinberg who goal is to "combat mass incarceration in the US by disrupting the money bail system." Over half a million people are in jail because they cannot afford to post bond which can often be as low as a few hundred dollars. That jail time costs the United States 14 million dollars. She has been working in the Bronx to post bond for such people. She found that 96% of them returned for their trials and thus got back the bail. In contrast to the 90% of people who make a plea deal when they can't post bond, only 2% of the people she posted bond for were convicted. Her new organization (The Bail Project) aims to pay bail for 160,000 people and thus make a significant impact on incarceration rates. The other winner that stood out to me was the team of T. Morgan Dixon and Vanessa Garrison (who spoke last year) and GirlTrek. Their goal is to make an impact on female African-american obesity by encouraging women to get out and walk in their communities. To illustrate the problem, they told about Erica Garner, the 27-year-old daughter of Eric Garner who was choked to death by police in NYC and famously said, "I can't breathe" before dying. She died of a heart attack. The day ended on an even higher note for me with TED Believers' dinner. Chris Evans and Nancy Duarte organized it, as they have the breakfasts in previous years. In many ways, the dinner was just like any gathering of newly acquainted Christians. Folks each shared a little bit about who they are and told stories of what God was doing in their lives. People shared about things like their struggles with wayward teenage children and family members with cancer as well as their personal triumphs. It always amazes me how Christians who have just met have the freedom to share in this way. The difference is that this group of people was much more extraordinary than at most such occasions. These are people making real impacts with the companies and philanthropies they work with. At the same time, they are--and know they are--flawed sinful human beings relying on the grace of God. It was an honor to be able to spend time hanging out with these folks.